THE MOST FRIGHTENING THINGS CAN BE BY SIMPLE SUGGESTION. Are you sure you saw what you saw? We begin not in the United States, but Yalta in Imperial Russia which we now call the Ukraine, Val Lewton was born on May 7,1904. To illustrate the confusion in the Russian and Yalta languages at the time. His name written in Russian was: Владимир Иванович Левентон. While in what was his actual native language as: Володимир Іванович Левентон, In English Val Lewton's name at the time of his arrival in this country was Vladimir Ivanovich Leventon. Like many Jewish families in Tsarist Russia they made the hard choice of converting to Christianity to avoid religious persecution. In 1909 Val Lewton's mother left her husband and moved with her children to Berlin and then eventually to the United States at Port Chester, New York. It was here that Vladimir Ivanovich Leventon became Val Lewton to assimilate within the community. What form of education the boy had between his arrival in the United States and the age of 16 I could not locate. The fact that Val Lewton who had come to America from Tsarist Russia probably not speaking a word of English became the society reporter of the Darien-Stamford Review, the names of two adjoining Connecticut towns, speaks a lot. However, he was fired for making up a story that a truck load of kosher chickens died in a New York heat wave. Again there is nothing I could locate of his life after his firing. Except that he was able at some point to enter Columbia University in New York City. Where he would graduate with a degree in English and Literature. At the age of 28 Val Lewton published a best selling pulp fiction novel "No Bed of Her Own". On December 19, 1932 the novel would be made into an MGM motion picture "No Man of Her Own". The only movie to co-star future husband and wife Clark Gable and Carol Lombard. Lewton received no screen credit for his novel on the film.and was working in the MGM publicity office in New York at the time. With his first novels success he left this position and wrote three more novels none of which became a best seller. Through the connections of his mother Lewton was given an interview across the country with Independent Motion Picture Producer David O'Selznick. He came with a screenplay based upon the classic Russian novel "Taras Bulba". Selznick did not purchase the screenplay, but the young man found himself hired as an assistant to Selznick and once more a publicist. In this capacity Lewton was both a story editor and writer. His first on screen film credit came in the classic 1935 motion picture version of Charles Dickens' "A Tale of Two Cities" starring Ronald Coleman and Elizabeth Allan. Before his name was written: "revolutionary sequences arranged by". In 1938 Val Lewton worked without screen credit as did many others on the screenplay for David O'Selznick's motion picture version of Margaret Mitchell's "Gone With the Wind". Specially he wrote the sequence at the Atlanta train station in which the camera pulls back to reveal hundreds of wounded, or dead confederate soldiers. Four years later found 38 year old Val Lewton being hired by RKO to head their newly created "Horror Unit" at a weekly salary of $250. There can be no doubt that neither RKO, or Val Lewton had any inkling that film history would be made as a result. 1. Each film had to be under $150,000. 3. Lewton had no control over the film's titles. His supervisors would give him the name and he had to make a film that fit it. In the 1950's these same basic rules would be used by James H.Nicholson to run American International Pictures. His main director Roger Corman and to some extant a Columbia Pictures producer named William Castle followed this principle. However, even these creative men could not equal the quality of what Val Lewton would turn out in a few short years at RKO. Lewton was handed his first title 1942's "The Cat People" and told to make a movie from it. The first thing Val Lewton did was find a writer and he turned to actor and play write DeWitt Boden. This would be his first motion picture screenplay and the two talked over ideas along with the director Lewton chose from the RKO pool as available. Val Lewton had worked on David O'Selznick's "A Tale of Two Cities" seven years earlier with director Jacques Tourneur. Together, Lewton, Boden and Tourneur created the perfect formula which is expressed in my opening sentence. Below Jacques Tourneur on the set with "The Cat People" stars Simone Simon and Kent Smith. The story tells of a man falling in love with a mysteriously beautiful women with only one quirk. When she becomes sexually aroused she claims to turn into a cat. In this case a Black Panther and kills anyone who stands in her way for the love of her mate. Beautiful French Actress Simone Simon played Irena Dubrova Reed the alleged cursed bride. Popular "B" actor Kent Smith played Oliver Reed the man who makes a mistake by marrying Irena. While Jane Randolph played Alice Moore the women who comes between them. The three leads would be back in a sequel two years later. What makes this film so terrifying is that Val Lewton and Jacques Tourneur do not use expensive make-ups such as was used by Jack Pierce in both "Werewolf of London" and "The Wolfman" to help frighten us, but play on the audience's fears through changes in the lighting, the use of music and no music setting a disturbing mood in our minds. A technique that would become a Lewton trademark and Tourneur would use in 1957's "Night of the Demon" aka: 1958's "Curse of the Demon". Throughout the movie the audience isn't sure that Irena can change into a Black Panther and there is a Black Panther at a local zoo used to put the audience into thinking maybe it is the real killer. Here is the famous swimming pool sequence that finds Alice Moore being taunted by Irena, or maybe its just her imagination. Which is a great look at Val Lewton's technique. On July 28, 1942 Val Lewton was given the title "The Cat People". On August 21, 1942 the movie was completed including all editing. The final cost including food, publicity and miscellaneous costs was $141, 659 on an original budget of $134,000. During its first two years of release "The Cat People" would gross 4 million dollars. This one film saved RKO from filing bankruptcy at the time and eventually would have a total gross of over 8 million dollars. So what title did his superiors at RKO next give Val Lewton? The somewhat laughable title "I Walked With A Zombie". Back directing was Jacques Tourneur, but this screen play was written by Curt Siodmak. He had, or would write the screenplays for "The Wolfman" creating the famous lines starting with "Even a man who is pure of heart----", "Frankenstein Meets the Wolfman", "The Beast with Five Fingers" and "The Son of Dracula" among many others. Val Lewton objected as sounding ridiculous a motion picture being called "I Walked with a Zombie", but was reminded that his contract was to make any film title his superiors at RKO came up with without objection. Apparently somebody at RKO had read an article from "American Weekly Magazine" about Voodoo in Haiti. So Lewton got with Siodmak and told him to look up actual Haitian Voodoo rituals to use in the motion picture, but added that Siodmak should model his story after "Jane Eyre" by Charlotte Bronte. Otherwise he could see no way to establish a narrative for an audience to follow as the article apparently was just a report about Voodoo in Haiti. The best way to describe this movie is to use an actual "New York Times" movie review for the picture that was released on April 21, 1943. What is interesting is by reading this review we also get to look back at the censorship issues for motion pictures during World War 2. "Horror" pictures are enjoying a peculiar popularity the country over at the moment, according to box-office statistics, so it seems reasonable to assume that RKO has a safe bet in "I Walked With a Zombie," which opened yesterday to a packed house at the Rialto and, at one point, drew a horrified scream from a woman patron. It's just like the days of old when "The Bat" and "The Gorilla" were scaring audiences out of their wits, and "Frankenstein's Monster" was making the night hideous for children and the more impressionable oldsters. Wit its voodoo rites and perambulating zombie, "I Walked With a Zombie" probably will please a lot of people. But to this spectator, at least, it proved to be a dull, disgusting exaggeration of an unhealthy, abnormal concept of life. If the Hays office feels it has a duty to protect the morals of movie-goers by protesting the use of such expressions as "hell" and "damn" in purposeful dramas like "In Which We Serve" and "We Are the Marines," then how much more important is its duty to safeguard the youth of the land from the sort of stuff and nonsense that their minds will absorb from viewing "I Walked With a Zombie"? ? ? I WALKED WITH A ZOMBIE, screen play by Curt Siodmak and Ardel Wray; based on an original story by Inez Wallace; directed by Jacques Tourneur; produced by Val Lewton for RKO Radio Pictures. Val Lewton's "I Walked with a Zombie" is now considered an intelligent and exceptional motion picture by movie critics and one of the greatest Zombie movies of all time. 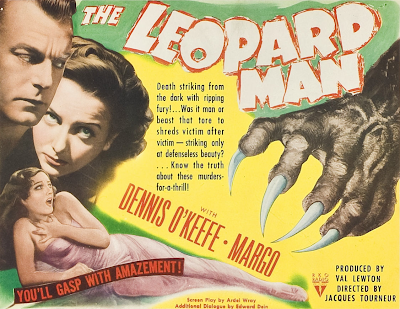 Some reviewers consider this film the best of all of Lewton's work. Of course today when you speak of "Zombies" most people think of the brain eating reanimated corpses that started back in 1968 with George Romero's "The Night of the Living Dead" and is carried on today, in 2015, with television programs such as "The Walking Dead" which was originally based upon a graphic novel of that name. Once more Val Lewton turned to director Jacques Tourneur. The screen play was by Ardel Wray and Edward Dein and based upon the novel "Black Alibi" by Cornell Woolrich. As a result Lewton's 1943 film was the first motion picture to attempt, although using the horror genre, a realistic look at a serial killer. The term "Serial Killer" would not be used until the 1970's and prior to that decade they were just called "Mass Murders". The setting is a small town in New Mexico where a night club owner hires a leopard as a publicity stunt for his night club performing girl friend, but her rival at the club causes the cat to escape. This is followed by a series of murders. The first of a little girl is thought to be from the leopard, but as they continue the question arises is it the leopard or a person "out for kicks"? I won't reveal it for you. DeWitt Borden was back as screenwriter, Tom Conway from "The Cat People" is also back, but Jacques Tourneur has been replaced by Mark Robson. Robson had been assistant editor to RKO film editor Robert Wise on both Orson Wells' "Citizen Kane" and "The Magnificent Ambersons". Robson was also an assistant editor on Lewton's first three features and would direct four of the next seven Val Lewton produced motion pictures including two of the three classics starring Boris Karloff. 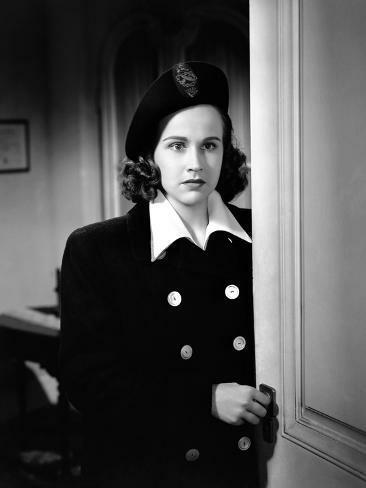 The film was "The Seventh Victim" and in her first film role Kim Hunter. Although she was billed fourth in this motion picture. Hunter would go on to Science Fiction fame as Dr. Zira in the first four of the original "Planet of the Apes" films. After having won the Oscar for supporting actress in 1951's "A Streetcar Named Desire" opposite Vivian Leigh and Marlon Brando. This is the motion picture that created the idea of an innocent girl attempting to find out what happened to her sister, or friend at a girls boarding school. Only to discover it is really a cover for a Satanic cult. The film has two interesting points in its story line. The first is there is a lesbian undertone in the relationship of two members of the school. For 1943 is is surprising Lewton was able to slip it by the censors. The other is Tom Conway is back as psychiatrist Louis Judd. As he was killed by Irena in "The Cat People" the perceptive audience must consider this film as having taken place prior to 1942's "The Cat People". Val Lewton's next motion picture would become part of a lawsuit against the producer and RKO. The lead character would be compared to a literary Naval Officer who wasn't created for another eight years and because of a predominantly male cast some reviewers suggest it had homosexual undertones . The movie was 1943's "The Ghost Ship". The film's draw was actor Richard Dix on the downside of his acting career. He had been nominated for Best Actor in 1931's "Cimarron" based upon the best selling novel by Edna Ferber who also would write"Giant". Dix was still very popular and had appeared in westerns playing Wyatt Earp, Buffalo Bill and even Sam Houston. His carrier started in silent films including one of the leads in the modern segment of Cecil B. DeMille's original "The Ten Commandments". The basic plot is about a young merchant marine officer who starts to believe his captain is mentally unbalanced and endangering his crews lives. This plot point has had reviewers compare Richard Dix's Captain Will Stone to Herman Wouk's character Lieutenant Commander Queeg in "The Caine Mutiny". The problem here, as I implied above, is that Wouk's novel didn't come out until 1951 eight years after this movie. The stage play not until 1953 and the motion picture with Humphrey Bogart not until 1954. So it would seem the reverse is in order and the reviewers should be comparing Wouk's character to Lewton's and not the other way around. In fact the question to ask the author is had he ever seen this motion picture? The director was once again Mark Robson who had just finished editing another Orson Wells film "Journey into Fear" starring Joseph Cotton, Dolores Del Rio, Ruth Warick and Wells. Robson made the decision with Val Lewton's agreement to film "The Ghost Ship" in the same style Wells had used on his feature film. It worked extremely well in setting the mood and psychological tone for the picture. The filmed open to very good box office at Christmas 1943,but by February 1944 was pulled by RKO as a result of a lawsuit filed against Val Lewton by two writers. Samuel R. Golding and Norbert Faulkner claimed they submitted a play to Lewton for consideration for a screenplay that was similar to the one for "The Ghost Ship" written by Leo Mitter and Donald Henderson Clarke. As a result of the lawsuit the film was never seen again until almost 1993 when it entered public domain as the copyright had finally expired. The courts had ruled against Val Lewton and it cost RKO $25,000 to Golding and Faulkner and $5,000 for their attorney fees. RKO also lost the rights to all future bookings. RKO informed Val Lewton of his next features title after having to deal with the lawsuit. They decided he needed to make a sequel to his most financially successful RKO motion picture "The Cat People". RKO executives thought to recover their losses. So the powers that be presented Val Lewton with the title "The Curse of the Cat People" thinking they would get another subtle horror film. They did not, but they would insist it was and publicize the motion picture as if it was. Lewton brought to the project screenwriter DeWitt Boden the original writer of "The Cat People". As for the cast Lewton also brought back the three leads: Simone Simon was once again Irena, Kent Smith played Oliver Reed and Jane Randolph was back now as Oliver's wife Alice Reed, On the surface RKO was very pleased as everything pointed to a horror sequel to the original. However, Lewton added one more main character Oliver and Alice's six year old daughter Amy. It would be the new character of Amy that Lewton concentrates upon and he even asked the RKO executives to change the film's title to "Amy and Her Friend". Which they refused saying it would not fit a horror movie. As this poster for "The Curse of the Cat People" clearly shows RKO had horror on the brain. Although the movie wasn't anything like the poster as the dailies showed. There wasn't one character who would change into a Black Panther. Although the audience saw Irena's ghost. The question became was she real or a child's imaginary friend that just looked like her? Gunther von French was assigned by the studio to direct the motion picture. Lewton had wanted Mark Robson, but was told he was not available. Von French had never directed a feature film and worked only on short subjects. By the 18th day of shooting on a 36 day filming schedule the picture was falling far behind. The RKO executives informed Val Lewton that they were replacing French with one of their film editors as director. The choice would turn out to be a perfect fit for the producer as it was Robert Wise. As I said Wise had edited the Orson Wells' classics "Citizen Kane" and "The Magnificent Ambersons" and had been Mark Robson's boss in the RKO editing department. From this directorial fill in Wise would go on to direct such films as: 1951's "The Day the Earth Stood Still", 1956's epic "Helen of Troy", "1961's "West Side Story", 1965's "The Sound of Music" and 1966's "The Sand Pebbles". He would also use his experience working with Val Lewton for the style of his 1963 adaptation of Shirley Jackson's psychological ghost story "The Haunting". Amy Reed is an introvert and is constantly daydreaming which is causing problems in school. Apparently this was also the young Val Lewton. A clue to those missing days of education I spoke of earlier. One day Amy finds a picture of her father's first wife Irena and the daydreaming girl suddenly sees her. Is she dreaming, or is this really Irena come back? The movie isn't horror, but it is an interesting look at the mind of a child and their creation of a fantasy world to deal with the realities of family and every day life. Do not be put off by this description. The film is very good and Wise's direction and editor's viewpoint was able to overshadow the first director's problems with dealing with a feature film. Gunther von French returned to directing short subjects and eventually television. He directed one feature film Merian C. Cooper's "This Is Cinerama", but that film used a documentary format. Possibly because of RKO's insistence to call the movie "Horror" audiences were disappointed and the box office wasn't good at the time of the film's release. Also, partly because of the slow pace of von French having been taken out of his medium of short subjects the budget rose to $212,000 and not the under $150,000 of Lewton's contract. This motion picture is still used in college psychology courses around the United States as a vivid look at that "danger of childhood" fantasies James Agree wrote about. How much really is this Val Lewton's own childhood I do not know, but he admitted to this motion picture having a strong autobiographical nature. Lewton's next motion picture didn't fall into his usual psychological thriller mode, but was about Juvenile Delinquency on the home front during World War 2 and actually caused quite a stir. This 67 minute movie was based upon a story by Herbert Kline inspired by a photo essay in "Look Magazine". The screenplay was by John Fante with additional dialogue by Ardel Wray. The title started out as "The Dangerous Age: and then became "Look to Your Children" and "Are These Our Children", the "Look Magazine" title, before ending up as "Youth Runs Wild". Originally the director was supposed to be Edward Dymtryk. Who went on to direct such films as 1954's "The Caine Mutiny", 1957's "Raintree Country" starring Elizabeth Taylor and Montgomery Cliff and 1958's "The Young Lions" with Cliff, Dean Martin, Marlon Brando and Maximilian Schell. However, at the last minute he bowed out to direct Ginger Rogers, Robert Ryan and Kim Hunter in "Tender Comrade". Dymtryk was replaced by assistant editor turned director Mark Robson. Robson and Lewton wanted to tell the story in semi-documentary form as they both felt strongly about the problem of children being ignored by inattentive parents in part caused by the long hours needed for the war effort. The technical adviser on the film was a teenager named Ruth Clifton who had set up youth recreational centers to give the kids someplace to go. Lewton argued that the intent of the film was to draw attention to a national problem and help bring about measures to solve it, which would do the country more good than harm. ... RKO decided not to pull the film from active production, but because of its controversial subject matter, Lewton was given more supervision than usual, much to his displeasure. At first RKO attempted to get the support of state and local authorities, because the motion picture was addressing the problems facing many of American's young people. The feedback was negative and even the U.S. State department felt the film should not be shown. Their stated position was that the motion picture might affect war time morale by implying that there were parents in the country who were inattentive to their children's needs. RKO wasn't sure they wanted to go with Val Lewton's original hard hitting cut of the motion picture. Which included a sequence were a teen kills his abusive father. So RKO had one of their other editors re-cut the film and then test marketed both versions. RKO not surprisingly released their cut which still listed actors that were no longer seen on the screen, because their parts had been cut out. The film lost the studio an estimated $45,000. At this point Val Lewton wanted to break out of horror films completely and approached RKO about doing a "period piece" based upon the works of French writer Guy de Maupassant. Lewton told his superiors that the film would be used as an allegory about the French resistance to Hitler. RKO agreed and Lewton was given Robert Wise to direct. The story was set in 1870 during the Franco-Prussian War and took its title "Mademoiselle Fifi" from one of the two stories by de Mauspassant chosen by Lewton. The Prussians were made more into the current Germans and the French more patriotic than during the actual events of that earlier war. Val Lewton and Robert Wise started looking at paintings made during the Franco-Prussian war to help design pictures look. Then as with all of Lewton's films the two combed the RKO lot for unused sets and found some from the 1939 Charles Laughton and Maureen O'Hara, her first starring role, version of "The Hunchback of Notre Dame". In the critical part of "The Little Laundress" was once more Simone Simon. It was decided that her breasts were too small for the part and artificial ones where created. Whenever she needed them Simon would ask for "Her Eyes". John Emery was her love interest Jean Cornudet and as the villain of the film the Prussian Lt, von Eyrick was Kurt Kreuger. I don't know of any American film which has tried to say as much, as pointedly, about the performance of the middle class in war. There is a gallant, fervent quality about the whole picture, faults and all, which gives it a peculiar kind of life and likeableness, and which signifies that there is one group of men working in Hollywood who have neither lost nor taken care to conceal the purity of their hope and intentions. The following year saw Val Lewton and Robert Wise return to horror in a classic version of Robert Lewis Stevenson's "The Body Snatcher".Lewton co-wrote the screenplay with mystery writer Philip MacDonald known later for his 1959 novel and the movie version in 1963 John Huston made from it "The List of Adrian Messenger". Using a pen name in 1956 he had written the novelization of the classic science fiction film "Forbidden Planet" and back in 1929 a novel "The Lost Patrol". Which would be made by John Ford in 1934 with one of "The Body Snatcher" stars Boris Karloff. The movie not only starred Karloff, but Bela Lugosi and Henry Daniell. This is a great period piece and very faithful adaption of Robert Louis Stevenson. Stevenson based his novella on the real life "Williams" Burke and Hare. Whose activity was known as "The West Point Murders" in 1828 Edinburgh, Scotland.The two sold 16 corpses to Dr. Robert Knox for his studies and well known, at the time, anatomy lectures. In the motion picture you have Boris Karloff as Cabman John Gray who is selling bodies to Dr. Wolfe "Toddy" McFarlane played by Henry Daniell. Bela Lugosi played Joseph the other assistant to Daniell. He overhears a conversation between Gray and McFarlane and learns the truth of about how the doctor is being provided with corpses. Joseph makes the mistake of attempting to blackmail the Cabman. "The Body Snatcher" was the first of three back to back motion pictures Boris Karloff would make for Val Lewton. It was also the last motion picture Karloff and Lugosi would appear in together. My reader we now come to my favorite all time horror movie. Val Lewton's "Isle of the Dead" once more starring Boris Karloff in a chilling portrayal. Point of information this motion picture was actually filmed before "The Body Snatcher", but released afterwards. You ever been afraid in a darken room you may have been within many times? Has a shadow on a wall seemed to move when it shouldn't? Perhaps a sound that should be normal at any other time just doesn't seem right now? Welcome to what Val Lewton and Mark Robson created in "Isle of the Dead". Are there really vampires, or walking dead on the island? Are we sure Mrs. St. Aubyn was really dead? Atmosphere, mood and spot on performances from the cast make for one sleepless night for the viewer. If you believe Martin Scorsese "Isle of the Dead" is one of the 11 scariest horror films of all time. The above shot of the approach to the island was inspired by an 1880 painting by German artist Arnold Bocklin, if it looks familiar to you. The painting was hanging in the main room of the house in Lewton's 1943 "I Walked with a Zombie". The time of the film and its setting is during the 1912 Balkan's war in Greece.The Isle in the film contains a cemetery were an odd group of people find themselves trapped when a man dies of septicemic plague and General Nikolas Pherides, Karloff, quarantines the island. You have two subplots. The Greek legend of the Vrykolakas an undead creature similar to a vampire and straight out of Edgar Allan Poe premature burial. The films cast includes Ellen Drew, Jason Robards, Sr., Alan Napier and Ernest Deutsch. Mark Robson was back directing his last film for Lewton. 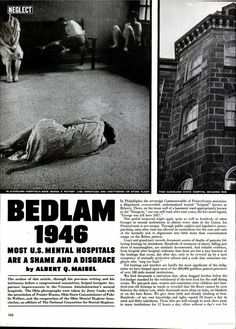 Which also happens to be Val Lewton's final horror film 1946's "Bedlam". It also starred for the last time with Lewton Boris Karloff. During the reign of Henry III in 1247 the "New Order of St. Mary of Bethlem" founded a priory in London. In 1330 this became a hospital known as Bethlem Royal Hospital who had a nickname of "Bedlam" which meant uproar or confusion. These are actual prints of the real "Bedlam" that were used as a basis for the movie's sets. The idea for the motion picture was inspired by a group of eight paintings done between 1732-1733 called together "A Rake's Progress" by William Hogarth. They tell the story of a young heir to a merchant's wealth who spends his fortune on gambling and prostitutes. He looses his money and from gambling debts first ends up in "Fleet Street Prison" and eventually in "Bethlem Hospital (Bedlam). This is the eighth painting of the young man now insane in "Bedlam". In the motion picture Boris Karloff plays George Simms an obvious fictionalized version of the real John Monro the head physician of "Bedlam". Who experimented on his "loonies" and held performances of great plays performed by them for the British Upper Class. Karloff relished this role and its probably his most evil performance. A portrait of the real Dr. John Monro. The film may be the first to use the idea of a spy entering a mental hospital to find out the truth and becoming a victim of the person in charge. In this case it is beautiful Anna Lee. In a very small role called "Dan the Dog" is actor Robert Clarke who had appeared as a student in Val Lewton's "The Body Snatcher". Clarke would have a solid "B" career and marry one of the famous singing "King Sisters". Who appeared with band leader Lawrence Welk. However, he has a bit of a cult science fiction following from the 1950's for two of his movies. He played the title role in 1958's "The Hideous Sun Demon" and the test pilot who in 1960 goes "Beyond the Time Barrier". Here is a shot of Clarke from "Bedlam" covered in real gold paint as he performs for the rich. Clarke in the back ground with Karloff, Anna Lee and Ian Wolfe. The movie broke all of the three rules RKO set for Val Lewton. It ran 79 minutes not under 75. The title was finally one of Lewton's own as was the subject matter and the budget far exceeded the top of $150,000 at $350,000. However, it lost RKO $40,000 initially. On the other hand it actually created a stir over mental health hospitals in the United States and the following article was a result. Val Lewton's next motion picture wasn't until three years after "Bedlam" in 1949. He also was no longer at RKO Studios, but Paramount Pictures for a one feature deal. The title of the movie was "My Own True Love" and revolved around a father and son loving the same girl. It took me a lot of research to even find that much out about it. There would be only two more motion pictures produced by Val Lewton after "My Own True Love" and released at two different studios. 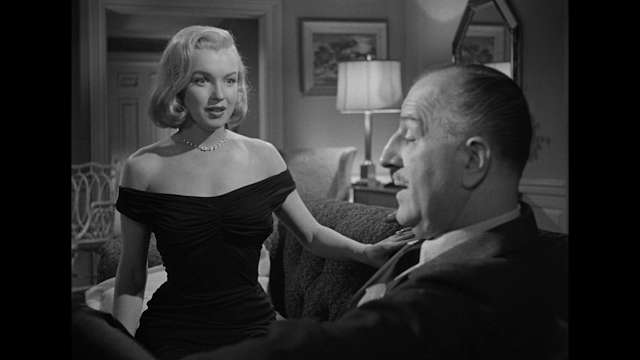 The first was through MGM and was a 1950 romantic comedy call "Please Believe Me". It was about a London girl who inherits a Texas Ranch and thinks she's rich and ends up with three suitors for her hand. The female lead was Deborah Kerr, but MGM wanted her replaced with the more popular, at the time, June Allison. Lewton held firm for Kerr and got his way. Playing the three suitors in her life were Robert Walker, Peter Lawford and what was supposed to have been Van Johnson. Johnson pulled out and Mark Stevens got the role. Also in the cast were two great character actors James Whitmore and J. Carrol Nash. The film was the largest budget Val Lewton had ever been given $1,055,000, but when the box office receipts were counted the picture only made $769,000. Could June Allison instead of Kerr been the difference? Only conjecture will tell. Val Lewton signed a contract with Universal Studios and his first production was a western called "Apache Drums". Its a good little picture, but it is his director that is somewhat interesting. Lewton was working with Argentinian director Hugo Fregonese who was perfectly suited for a western movie with U.S. Calvary and Apache Indians. In 1945 Fregonese had made a film in Argentina entitled "Savage Pampas". He would remake the movie in 1966 in English starring Robert Taylor. It tell of 19th Century Argentina and the Calvary units at outposts guarding the area and protecting settlers to the newly opened Argentine deserts from native Indians. Not a bad switch from one country to another. Apache Drums is tense and exciting fare when its green and red-painted Indians, yelping and keening, ride to attack or literally bite the dust with authentic thuds. When it is loquaciously appraising its principals, it is, to quote one of them, 'kind of dull and tame. The Apache in the above scene and for that matter the entire motion picture are very unusual, but pure Val Lewton genius. RKO refused to give Fregonese and Lewton a budget that included hiring stunt men. Raising the question how do you film a western with Apache's on the warpath without stunt men? His answer was to hire Life Guards and Surfers from Santa Monica, California. Put them in warpaint and have them do the stunts. As this picture was being released Val Lewton received a call from producer/director Stanley Krammer who wanted to hire him as his production assistant at Columbia Pictures. Lewton immediately resigned from Universal Studios and was to begin work on 1951's "My Six Convicts". Sadly he developed gallstone problems that led to the first of two back to back heart attacks. Val Lewton at only the age of 46 passed away at Cedars Sinai Hospital on March 14, 1951.